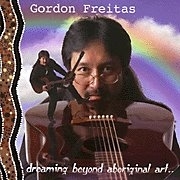 Only six months after his LOCAL FOLK cd, Gordon released DREAMING BEYOND ABORIGINAL ART... and answered the request for many of his songs heard at his live performances. Up close and personal... he deals with universal themes that extend beyond these island shores. For example, SAD MARY is a beautiful song that addresses domestic violence... while SAY GOODBYE TO SAILOR MAN has become a popular song to play at Navy retirement ceremonies around the world. Check out the song he wrote for the USS Arizona Memorial... It's a Home Grown winner ! In a Star Bulletin review, John Berger said, "...Peaceful Arizona is the best Pearl Harbor song to date..." That review also stated what most of us already know... his "debut album,'Local Folk' was brilliant. His newest one, 'DREAMING BEYOND ABORIGINAL ART...' equals it." Check out the pictures formed by these lyrics. Read a wonderful letter from a fifth grade school teacher describing their Peaceful Arizona Experience. You can visit his tribute site and link to some wonderful sites that keep the historical record of Pearl Harbor straight and true. In 1999 this album earned him another Hawai'I Music Award and recognition as Hawaii's Country Artist of the Year for the second year in a row. "I draw the themes for my songs from things I see or read about everyday. It could be something I hear on the news or even a bumper sticker or something somebody said that gets stuck in my head. I am mostly proud of the versatility these songs have… they can be performed soft or hard without losing their message or the story in the lyrics. They are not contrived and reliant on a hook-line repeated 50 times in 3 minutes... they are all original and a reflection of the world as I see it. I guess I could have painted all these things on a canvas, but it sure is a lot more fun getting out there and singing them ! Mahalo plenty and thanks to all of you around our planet for the support that frees me from the usual white pants and kukui nut luau gig and allows me to keep dreaming beyond aboriginal art... Drop a line and say aloha!" Is the heart of a man truly all he is worth ? And is heaven a dream that you find here on earth ? It’s a ping-pong game in the water world..
All songs copyrighted ©1998 and written by Gordon Manuel Freitas (BMI) & published by Blue Tarpolin Music (BMI), ALL RIGHTS RESERVED.